Skillfully designed, this !nspire bench is just what you need to complete your space. The combination of solid wood material finished in blue will add a contemporary flavour to any room. The blue frame is durable and elegant for your home. The beauty is in the details of this marvel of modern deco. 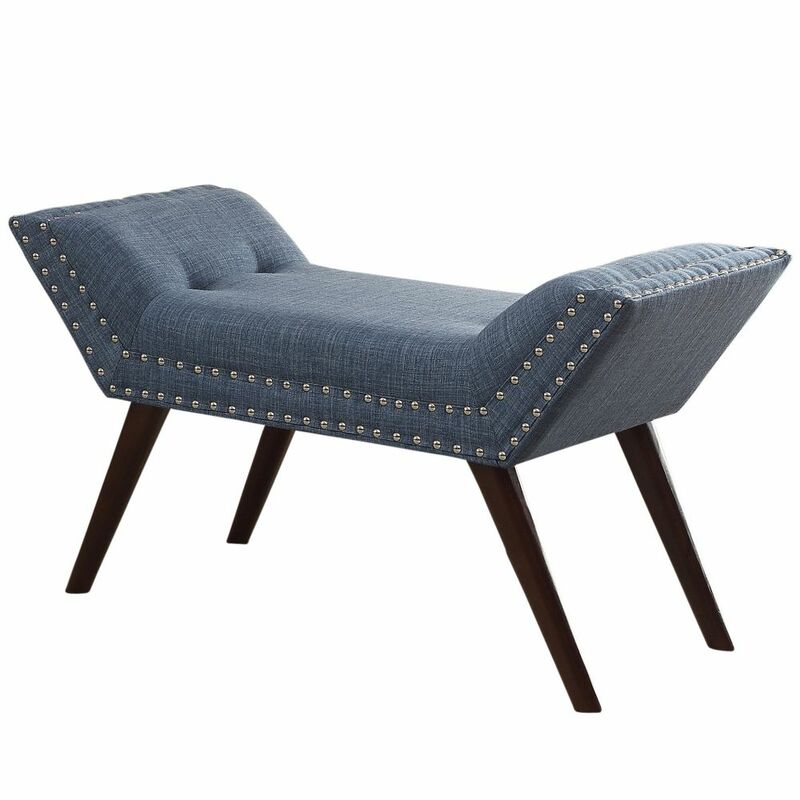 Artfully designed to impress, your guests may find themselves breathless while admiring such a masterful rendition of a classic cocktail ottoman. Fully immersed in resilient linen-textured polyester with sophisticated plush button tufting, a neutral beige colour scheme is complemented by brilliantly reflective chrome studded detailing. Hidden castors make it easy to slide this piece anywhere you'd like, without disrupting the overall magnificence and view of such a delight. And your coffee table books have never looked as good as when they're allowed to nestle on top of the intelligent two-tier display, allowing more than ample storage opportunities for all your essentials. The glamourous palatial feeling that this settee inspires is unrivaled. Outfitted with an abundance of rich grey velvet, the high curved back and rolled arms of this piece create a dramatic flourish of style and sophistication. Inspired by French design and displaying an appearance right off of a high-end fashion runway, this settee is meant to thrive in a place of relaxation like the bedroom, sitting room, or living room. Whether youre lounging, cuddled up with a good book, or simply enjoying the ambiance around you, this settee will turn the ordinary into the extraordinary. Lana 35-inch x 18.25-inch x 17-inch Solid Wood Frame Bench in Blue Skillfully designed, this !nspire bench is just what you need to complete your space. The combination of solid wood material finished in blue will add a contemporary flavour to any room. The blue frame is durable and elegant for your home. Lana 35-inch x 18.25-inch x 17-inch Solid Wood Frame Bench in Blue is rated 5.0 out of 5 by 1. Rated 5 out of 5 by Sandy62 from Great little bench. I bought this bench for our bedroom for my husband to be able to put on his socks. I like the colour and design; more interesting than most bedroom benches. For the price, it's well-made. Happy with my purchase.